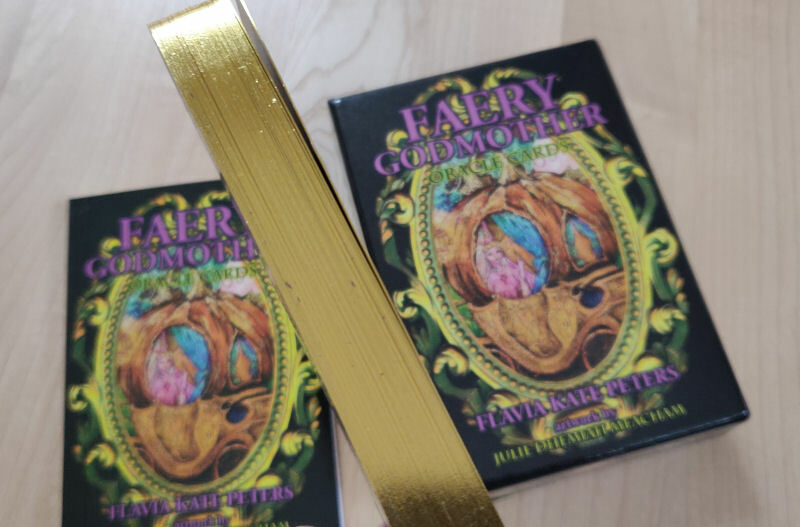 The Faery Godmother Oracle Cards by Flavia Kate Peters, illustrated by Julie Dhemiah Meacham, transports you to a world of mirrors, each one leading to its own mystical realm. The art and the keywords in this deck are evocative, whimsical, and to me, perfect for inner child work. The artist, who goes by Dhemiah, paints in a fairytale style. She’s called to the spirit and magical realms and her art reflects the visions she channels from what she refers to as the “other worlds.” Her works are primarily done in acrylics and watercolors. Before we continue with the review, three cards are presented to you above. Choose one: left, center, or right. Then at the close of this review, we’ll see what your card pick was and read its corresponding entry from the guidebook. Flavia Kate Peters herself is an angel therapy practitioner, connects deeply with the realm and mysticism of fairies, and works as a spiritual healer. Her 40-card Faery Godmother oracle is a sensitive, centering deck to work with. The key focus word on each card are prodigiously apt when these cards are pulled for one-card daily draws or when you pull a few in answer to a specific question. “How often have you felt ignored, unappreciated, misunderstood, unsupported, discouraged, or unsafe? In those moments we need someone to reassure us…. someone who has your best interests at heart… your very own Fairy Godmother!” reads the Introduction. The deck comes in a two-piece box and the cards themselves have a laminate finish. I love the gilded edging and compared to standard issue oracle decks, this one can feel a little slim in the hands. The 100-page illustrated guidebook is the perfect companion to the cards. This deck is molded from the belief that each and every one of us has a Faery Godmother who you can call upon. She’s there to help you gain a sense of self-sufficiency and to work with you to unearth hidden emotions and calm your anxieties. That’s the premise of the deck and you don’t even need to use it for divination per se. You can simply state your wishes or fears to the cards. Peters gives the example of shuffling the deck and stating to the cards: “I wish to have the courage to come out of the closet” or “I need help as to where I should be investing my energy.” Then pull a single card, take time to absorb its message as conveyed through the imagery and the key focus word. Then turn to the guidebook for further insight. At first I was intrigued by the deck’s premise. Then when I first opened the package and looked through the cards and guidebook, I didn’t think I was connecting to the artwork or the themes expressed. So I set the deck aside for a while, not quite knowing what I would do with it. Then came a darker, lower moment in my personal life and although I had decidedly put the deck away, out of view, somehow– and I don’t quite know how– I was sitting alone one evening, pensive and simmering in my own depressive thoughts, when I looked out of the corner of my eye and sitting on my work desk was the Faery Godmother Oracle Cards. I thought, why not, and opened the box. I didn’t even have a specific question in mind. I simply stated: Please help me. I don’t even know in what way I need to be helped. Please send me the guidance I need right now. 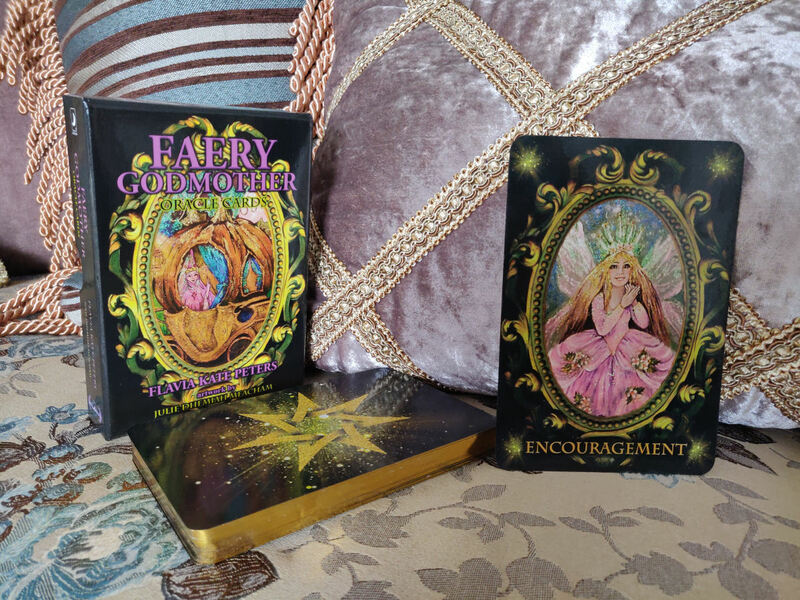 The card I pulled was Encouragement, depicting the imagery of a fairy godmother in all her splendor, glittering wing, tiara, long locks of golden hair, and a pink gown adorned with flowers. The key focus word and imagery was more than enough, but I opened the guidebook nonetheless. You’ve come so far, don’t back away. You’re almost there, keep going, stay! It may be hard, times are tough. Circumstance has made it rough. New beginnings, much to do. My advice? See it through! Faery Godmother Oracle was released back in December of 2018 and I’ve heard so very little fanfare about this deck. It’s got to be one of the most underrated oracle decks ever, though I have my speculations as to why. If I’m being candid, design-wise there are several missteps. The aesthetic point of view in totality feels like something straight out of 1991 and dropped in the middle of 2018-2019. The card back design is a little garish for modern preferences and staying consistent with that early 90s vibe, the images on the card faces are blurry and pixelated. There are also thematic inconsistencies. Most of the artwork is based on a well-known fairytale, but then every once in a while, you have very modern imagery, like what you see above in the card Exertion– a modern gym with fairies exercising on stairmasters. While I appreciate the concept of the looking glass and golden-framed mirror motif in the border design, it takes up almost 50% of the surface area of each card face, if you really think about it. The four corners of each card is wasted space and for the most part, the bold contrast of black and gold in the border design doesn’t match the soft, feminine, fairytale princess style artwork inside the frames. Even the choice in font style (which comes across a little too modern) could have been better thought out to echo the fairytale theme of the deck. After reading through the guidebook cover to cover and learning more about both the deck creator and artist, I don’t even think the harsh black borders match their styles. Design-wise, I would have gone with a much, much lighter border, not so much heavy-handed black, and either emphasized the digital computer art features or the acrylic hand-painted soft magical realism of the actual artwork, and not tried to combine both. The two styles brought together was not a good balance and just resulted in the card art feeling noisy. And yet here’s the thing. When I’m feeling most isolated and helpless, this is an oracle deck I would reach for. If you look past some of the errors in design judgment made here, the content of the guidebook, the focus words, and Dhemiah’s paintings themselves are absolutely exquisite, full of charm and truly do feel magical. The soul of these cards are absolutely beautiful and if you can look past some of the design variances and atonality of the aesthetics, this oracle deck can and will facilitate catharsis. There’s a lot of magic here, a lot of spirit, and a charm that will bring so much blessing into your spiritual life. Perhaps nothing is ever truly in error. You have to be in a place where you can overlook the superficial, when you are in a moment of genuine need for that fairy godmother style guidance and support before you can access the full range of this deck’s capabilities, before the truly beautiful soul of this deck reveals itself to you. Faery Godmother Oracle was, to my great surprise, not light and fluffy. I went through a dramatic range of feelings about this deck, which only adds to the deck’s credit: it challenges you to develop and cultivate a relationship with it and with the energies it represents. Give Faery Godmother Oracle a chance and you might just very well be surprised by how it enriches you, supports you, and looks after you in your darker hours of need. Let’s close this out with an oracle card draw for you. Do you remember which one you chose– left, center, or right? My nursing mission is to heal. I’ll wrap you up in cotton wool. The left card is Healing. We see an Alice in Wonderland like figure with a nurse cap, apron, and stethoscope. She’s administering medicine and tending to wounded, injured, and sick animals. Your cry for healing help has been heard! The indescribable hurt and pain that you are suffering has taken its toll, and it’s hard for you to believe that you will ever overcome this grief. But please know that eventually your hurt will heal. . . . Take comfort in knowing that you will soon be returned to peace. In the meanwhile, rest within the protection of my wings as you are nurtured and cared for. Heal well, dear one, and never, ever give up. of wonder, enchantment, and all of that kind. journeys to take, wishes to keep. Dreams reveal what is to be. Trust in the answer, then wait and see. The center card is Dreams. We see a fairy peering in through a castle window and in the foreground, a magical spinning wheel, calling to mind Sleeping Beauty. Yes, you create your own destiny, but the stars point you in the direction of your dreams. With this in mind, take some time to decide what it is that you wish to come true. Take this opportunity to focus on a life-long dream or ambition. Whatever you feel is right will be supported fully by the universe. When you go to bed, do so with a sense of excitement, for you are going on a journey. . . . It is important that you acknowledge your dreams, for this is divine connection. . . . Your newfound awareness and perception will open doors to many realms. I will accompany you as we fly high through the sky and bathe in the colors of the rainbow until we reach . . . the pot of gold, your holy grail. Child of Nature, hear the call. Switch off the TV! Forget the mall! Buzz of bee, croak of toad. Nature heals your heavy load. Walk or swim, run and hide. Time to go and play outside. The right-most card is Mother Nature. In the background perched at the top of the hill is a stag and in the foreground, burrowed inside the stump of a tree is a sleeping fox. We see a squirrel, badger, a fairy, and a tree gnome close by. By the way, the little rhyme here seems to be showing its age, perhaps? The mall? I can’t even remember the last time I physically stepped foot inside a mall. I mean, it seriously could have been a decade ago. The natural world is calling to you. If you listen carefully you will hear its messages coming through to you through the rustle of leaves on the trees, the caw of a crow, and the babble of a brook. But of course, you will have to venture outside and get into nature first! This I encourage you to do. . . . You are a child of nature, who naturally hears the whispers of spirit through the breeze… Let’s take a walk together through forests, meadows, and parks until your heart sings once more at the mere notion of the magic of nature. Let’s reawaken the affinity you have with the ways of natural healing as well as your belief in another world of mystical beings.… It is time to step up and take responsibility for the guardianship of the natural world around you and this beloved planet as a whole. I ended up falling in love with my Faery Godmother Oracle Cards. The lukewarm public reception has been due in large part to very superficial judgments of the deck’s aesthetics. Compel yourself to go deeper, to see the soul of the cards, not just its surface, and you’re going to find something truly magical and magnificent, as I have. Order your copy of the Faery Godmother Oracle here. FTC Disclosure: In accordance with Title 16 of the U.S. Code of Federal Regulations Part 255, “Guides Concerning Use of Endorsements and Testimonials in Advertising,” I received the Faery Godmother Oracle Cards from the publisher Llewellyn and Solarus, Ltd. for prospective review. Everything I’ve said here is sincere and accurately reflects my opinion of the book.